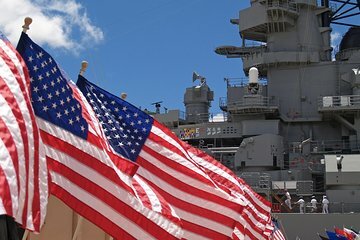 Combine visitas a tres de los monumentos importantes de Oahu, cada uno honrando eventos significativos en la historia de los Estados Unidos: el National Memorial Cemetery of the Pacific, el Battleship Missouri y el USS Arizona Memorial. El acceso sin escalas, el almuerzo y una visita guiada de 35 minutos de Battleship Missouri están incluidos. Este recorrido de 9.5 horas incluye el transporte entre los tres sitios, además de un recorrido por el centro de Honolulu. Transporte de ida y vuelta desde hoteles seleccionados. Did not get to watch the movie. Almost didn't get to go out to the Arizona Memorial due to the water. We liked Jake, but had to wait for him several times. Would have preferred having a personal guide to tour rather than the earphones. Lunch was great. This was an Awesome tour. The documentary film was very informative and touching it showed us what occurred before, during and after the attack. Afterwards we had free time to take photos and listen to the monuments on the grounds this was enjoyable. We then boarded the shuttle over to the USS Arizona it was a quick boat ride and once we arrived at this beautiful monument I don't have the words to explain all the emotions, I will just say was a very humbling experience. Back on the bus and off to the Missouri, we had lunch before beginning the tour and it was good the items we had were fresh and hot. Once again the tour of the ship was very informative and your were given time after this to look around and take photos before your were back on the bus for the Punch Bowl tour this was nice casual ride you had time to take photos from your seat while riding back thru the city past some very historical sites. This really topped off this tour. Everything went very smoothly THANKS to our driver and guide Vi. He was very knowledgeable and the information on the sites, culture, and language. He made this tour a very memorable experience for us. Listen to your guides directions and time frames for each area so you can get the most from this and you will be pleased with this tour. the tour guide was excellent- He kept us informed all the way. It was an early start but well worth it. To to see where history was made was truly amazing. The visit to USS Arizona was a humbling experience especially after the information received in the first part of the tour. I had not realised the enormity of the destruction and the amount of lives lost. The visit to the USS Missouri was fascinating-its history amazing. To be able to see a real battleship and to tour it was mindblowing. Would recommend the tour.